The Alliance of Indian Waste-pickers (AIW) secretariat and its members have been receiving requests from activists, concerned citizens and civil society organizations to mentor for organizing wastepickers. Till now, CAG Chennai, Dalit Bahujan Resource Center and Guntur have been informally mentored by Alliance members. It has been realized that the mentoring process of organizations and individuals need to be institutionalized to enhance the learning. A three-month fellowship programme has been instituted through which major organization-members of alliance will incubate interested activists and concerned citizens. As mentioned above, it is a three-month and intensive mentoring programme where interested activists will get hands-on experience of organizing workers, engaging with municipal and other relevant government bodies, different models of integration of waste pickers, market and technological frameworks for efficient waste management services. As part of the fellowship, accommodation, travel and sustenance allowance are to be provided. The fellowship will be awarded after request for interest and the participants in the fellowship programme can choose the organization with which they would like to work and learn from for 3 months. Interested individuals can apply by submitting a statement of purpose in Hindi or English; they need to have a recommendation letter from one of the member organizations. Programme Committee members of Alliance of Indian Wastepickers will interview the fellow and provide for fellowships. The expectation from the fellow is to organize a minimum of 250 waste pickers in his/her respective geographies within a year of the rewarding of fellowship. 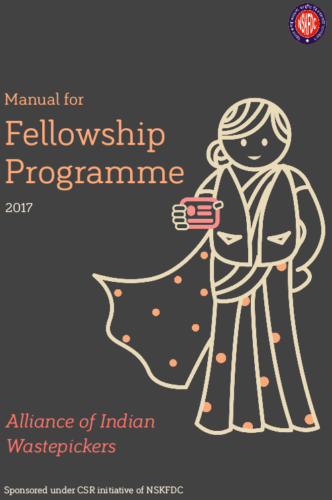 The details of the fellowship is provided in manual, accessible on the following link (download PDF). Monthly Stipend: INR 7,000 /- for 3 months + Accommodation (maximum of INR 7,500) + local travel and communication (INR 3,000) + train fare from their city of origin to the host organization. In total, expenditure on each fellow – INR 60,000/-. The fellowship is open through the year. Apply!